Smartphones have taken over the market in the present world with the majority of the share held by the Android and the IPhones. Most people us their smartphones to access the internet, browse websites or engage themselves in social media over the internet. This percentage of users keeps on increasing every year. The mobile companies are therefore making sure that they meet the demands of the people and remain on the top of the market. Also, all business companies thus make sure that they have mobile-enabled websites. The mobile-enabled websites help to bring those potential clients who access internet through mobiles or tablets rather than desktops. You can read advantages of mobile website optimization for Search Engine Optimization (SEO). 1. Accessible to every customer: There are many consumers who access the internet and browse websites through their phones instead of computers or laptops. For such users, there must be mobile-enabled websites so that the business sites are available to them too. Some features like the click-to-call and the mapping functions are present only on the mobile enabled ones. Also, this feature gains more importance for local businesses. When the user comes in close proximity to your store, they can find your site more quickly through the location-aware technology that is used by websites that are mobile enabled. 2. Provides a better user interface: The websites that are mobile enabled have proper features for smart phones like to adjust the size of the site as per the screen. 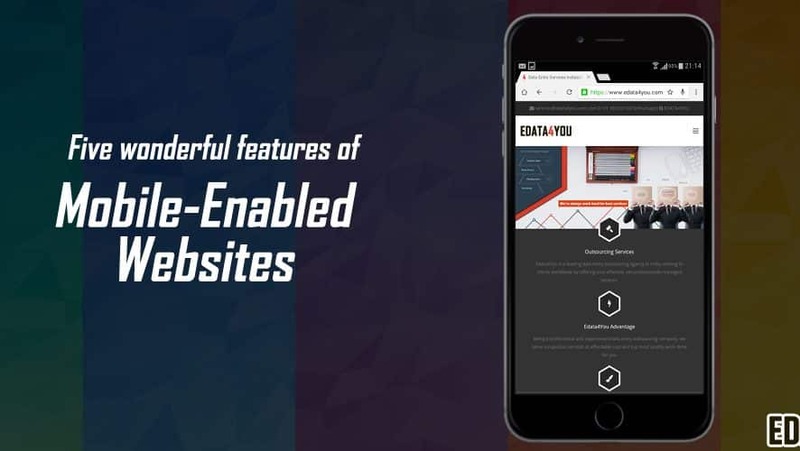 It has been found that an appropriate interface is available for a mobile-enabled websites, and thus users have a better experience rather than browsing on the desktop. 3. Better rankings on Search Engines: The search engines have a higher ranking when mobile enabled. They will be placed in the mobile and local directories and thus can provide better service and experience to the users. 4. Gets a reputation for your brand name: When people see a website on their mobile they term it as web savvy and on trend brand. Consumers have a habit of comparing different brands to gain their benefits, and thus they also judge them on the basis of availability and accessibility. A mobile-enabled websites would help to get positive comments from the customers and give a competitive advantage to the other brands that do not have a mobile site. Even though all the sites eventually become mobile-enabled websites, but the company should make sure to provide such features that would beat all their competitors. 5. Accessible through QR codes: To connect the customary and the digital forms of media, QR codes are used in all mobile devices. All advertisements can access a QR code that will take the users to their mobile enabled pages and provide flexibility in usage of the internet. Keeping all the points in mind, the website designers must be explicitly told to allow website design for mobile use too. It would definitely provide a lot of benefits and enhance business.